This new era of Biba saw the introduction of the peripheral merchandise that was to become so important in spreading the brand name. Back in 1966 a calendar and a diary had been produced for the following year, but this was a low-key affair compared to the plethora of products that spilled out of the High Street store. Suddenly there were address-books, diaries, watches, passport holders, cigarette-lighters and more, all bearing the logo, all proclaiming the owner of the item to be a participant in the Biba experience. And they were all wildly popular, the simple black-and-gold identity rendering them instantly recognizable and desirable. Ever-more adventurous diversification was undertaken, including – amongst the projects that never materialized – plans for Biba cigars and cigarettes. An upmarket, re-launch of the mail-order catalogue offering made-to-measure outfits was also proposed, as well as a low-cost diffusion line to be called Thomasina. Most spectacular of all was the concept of the Biba car. The brief, as outlined by Fitz, was to produce a vehicle that would cost the same as a Mini but would have greater accelerating power. Responding to this specification, Whitmore Thomas got as far as creating the plans for a wedge-shaped car, complete with voluminous ash-trays and a set of matching luggage specifically designed to fit perfectly in the boot. Sadly, it never got beyond the drawing board, overtaken by events in the expanding Biba empire. Despite these extra-curricular activities, the biggest hit of the period were the Biba boots – high-heeled, knee-high footwear that came in suede and in canvas and boasted an array of colours: pink, mauve, dusty blue and more. ‘Nearly every girl had a pair of these Biba boots,’ remembers hair stylist Trevor Sorbie, then living in Essex, ‘they were so popular.’ The continually evolving range encouraged repeat visits: ‘That excited us: we went every week. And the word got around … they were so cheap.’ Tony Porter, who had moved from mail-order to the store, also recalls the popularity of the items: ‘There was an absolute fight when there was a delivery. The lorry would pull up in the little street behind the back and girls would be waiting there to see it coming and then run round to be the first in the queue.’ Barbara later wrote that 75,000 pairs of the boots were sold in the first three months. So ubiquitous had the name of the company become that the expression ‘Biba boots’ was in danger of losing its unique status and becoming applied generically to the style rather than the product. Similarly the idea of the Biba top or the Biba t-shirt – one of Barbara’s early designs featuring a tight-fitting body with high armholes and a drawstring – was spreading to other manufacturers looking for slipstream sales. In this latter instance, Biba was obliged to go to the High Court in 1972 to get an injunction against Stratford Investments Ltd for breach of copyright on the use of the term ‘Biba t-shirt’, and won a judgement that is still cited as a precedent in case law. The scale of Biba’s success in Kensington High Street was quite extraordinary. It was attracting 100,000 visitors a week – up to 30,000 of them on a Saturday – and could claim an annual turnover of more than £200 per square foot, compared to the £75 achieved by John Lewis and the £50 of an average department store. 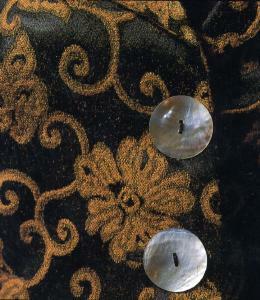 Meanwhile, there was also a growing critical recognition of Barbara’s designs: in 1971 an exhibition at the Victoria & Albert Museum titled ‘Fashion: An Anthology’ included two of her pieces – a skirt suit and a girl’s dress, both in black velvet – that had been donated by Cecil Beaton, marking the first appearance of Biba clothes in a museum. And there was approval too from more orthodox quarters; when the Business pages of the Observer looked back at the stars of the Sixties economy, it included Barbara as the only woman in the company of Sir Lew Grade, Richard Seifert, Sir John Cohen, Lord Stokes and Jim Slater. There were those at the time who doubted the wisdom of the expansion from Church Street, and there are still many habitués of the early shops who regard it as being a step too far away from the original vision, but the sales figures were a triumphant vindication of the development. As the white heat of Harold Wilson’s technological revolution began to cool, and Britain sought reassurance from semi-detached, suburban Mr Heath, Biba was going from strength to strength.